People nowadays spend their money more on traveling rather their own luxuries, material things or other comforts in life. We are very adventurous exploring places around the country, in Asia, or in all over the world. With this, we don’t only get into actions or activities, but we also get to experience variety of food. I’m saying this because people now are very knowledgeable when it comes to food because of traveling. They are very adventurous and experimental not only on traveling but also in eating. 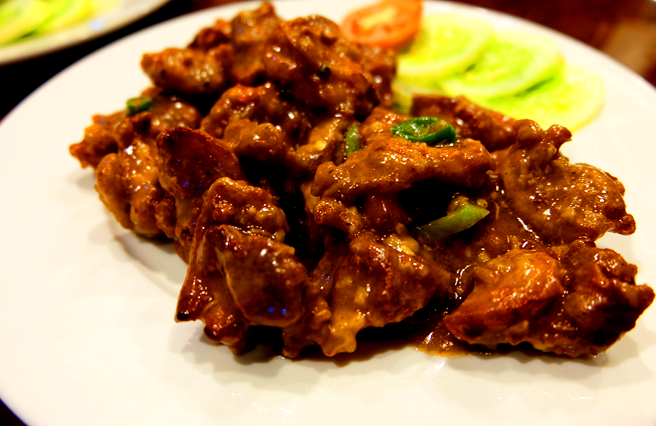 That’s also how the restaurant businesses with fusion cuisines are becoming successful here in the Philippines. Just like what the owners of Galli Village Cafe did. Owner Christine Arriola-Villongco is a certified wanderer and a foodie. The business started as a hobby together with her husband (where they actually got the name ‘Galli’ from their family names). 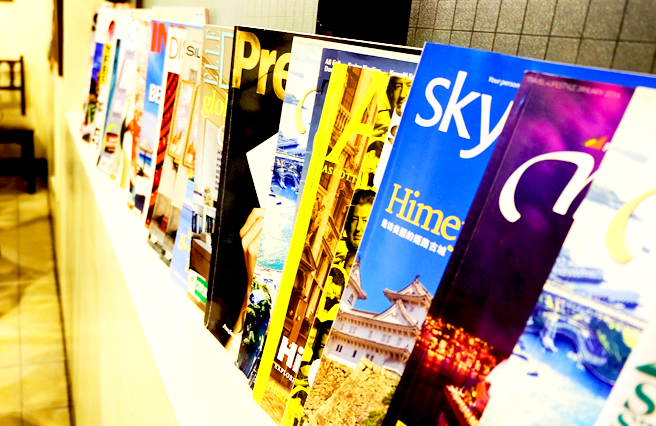 They love to travel and so they wanted to share their memory trips. And that’s how they made the concept of their first business established 5 years ago. The concept of Galli Village Café is inspired by images of small village cafes found scattered in many European, Asian, and American countries. 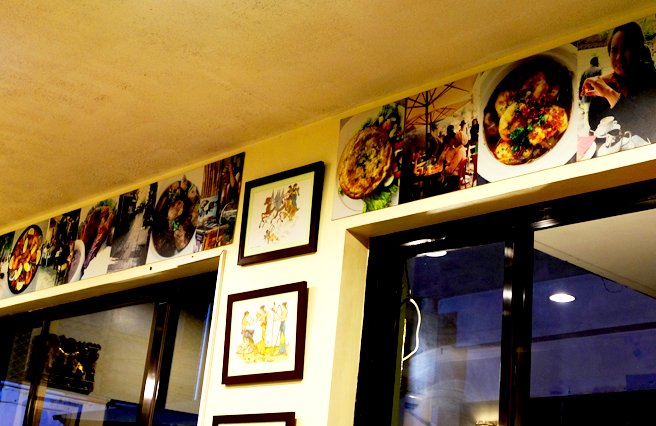 Photos of these are pasted on the walls of Café. These are favorite destinations of the local people as well as travelers who mingle with each other to make these cafes places of interest. It’s actually like an exhibit of their photographs – mainly the travels they made together. They also display some of the souvenirs they get when they travel. Since both of them are devotees of Sacred Heart since 2005, they put up their first restaurant branch at YMCA of Makati Building in Sacred Heart Street, San Antonio Village, Makati City which is just across the Shrine of the Sacred Heart Church and 3 minutes away from Ayala Avenue. From Ayala-MRT Station, ride a jeepney Ayala Avenue bound. Tell the driver to drop you off near the Makati Central Police Headquarters, then walk or ride a tricycle to Sacred Heart Street. The YMCA building is just across the shrine. If you’re coming from North, ride at North Ave-MRT Station and alight at Buendia Station. From there, ride a jeepney LRT bound and tell the driver to drop you off at RCBC Plaza. Then look for the Makati Central Fire Station because from there you can just walk or ride a tricycle going to Sacred Heart Street. make you enjoy the ambience and pleasure of quiet dining. 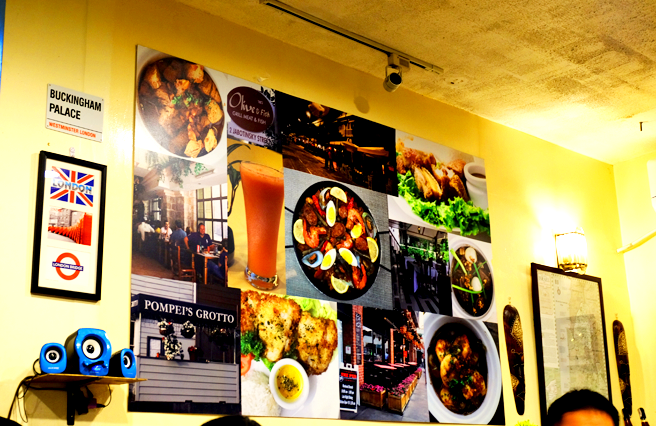 It is unlike the usual restaurants in Makati district because its surrounding areas are not business-like. It is simple but it has character. 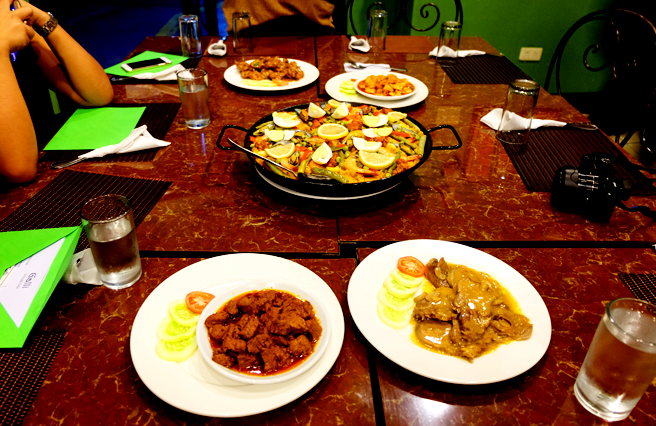 For their dishes, they mainly offer Spanish-Filipino fusion cuisines. They serve breakfasts, pasta, rice meals, salads, and sandwiches, plus desserts! I was able to taste some of their popular dishes like Paella Valenciana, Beef Salpicao, Shrimp Gambas, Lengua Con Setas, and Chicken Al Ajillo. 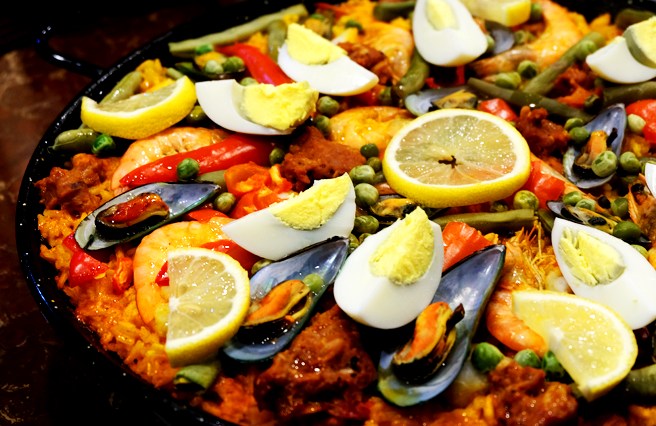 The specialty of this restaurant is the Paella Valenciana. For Php300/590 it can already serve 4-5 persons. Actually, I am not a fan of Paellas because I easily lose appetite after eating it maybe because it’s too tasty for me. But I was surprised when I tasted Galli’s own version of Paella, it’s really yummy with its flavorful rice added with lemon that makes an exact flavor taste. On top of it are huge prawns, eggs, mussels, chorizo slices, and some vegetables. You can already order this as for your full meal. And in case you’re planning to order this, you need to say it in advance because they don’t serve precooked. So it will take around 40 minutes for it to be served. I love their Shrimp Gambas. It has the best taste of flavored spice and garlic and it sticks into the shrimp. Also, they use a real and fresh prawn that’s why it’s really red. Perfect match also with rice J Downside only for me is the small serving of it. 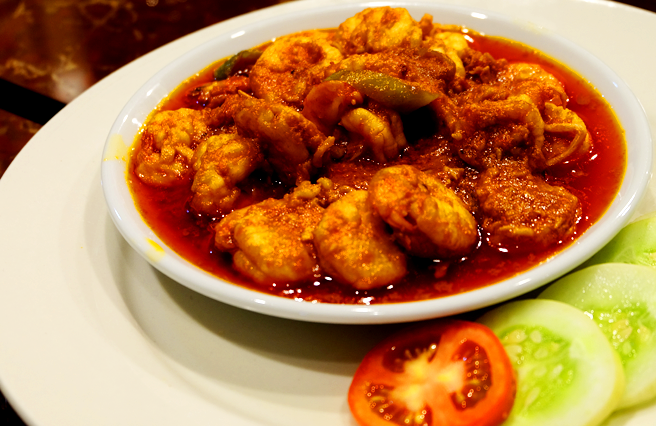 Chicken al Ajillo has a simple taste but it’s good. You can add it to your order of dishes partnered with rice. 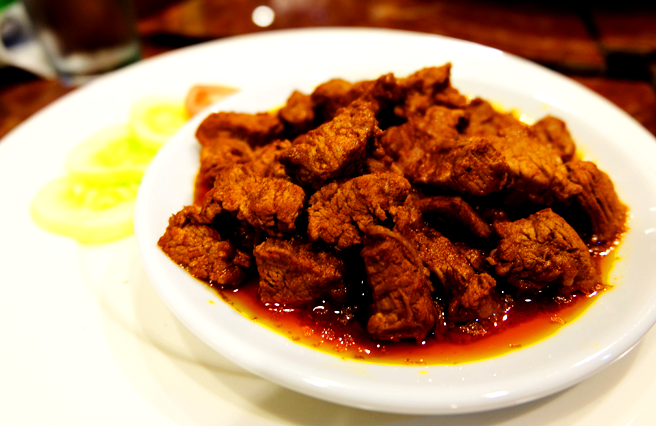 Lengua Con Setas is an Ox tongue. It's so tender and the sauce is creamy and very tasty. Another best dish from them. Their Beef Salpicao was okay. 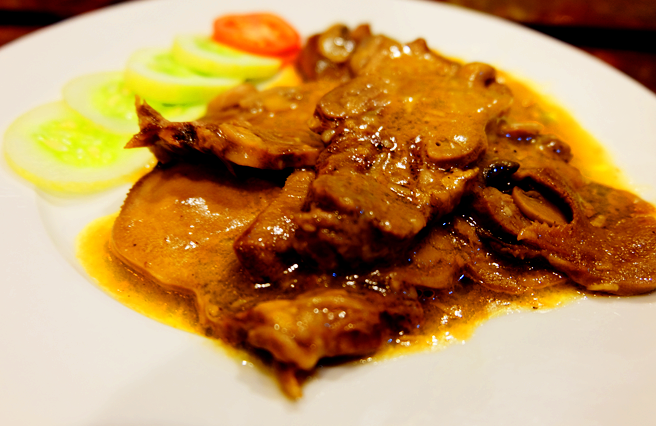 It’s not that tasty but they use beef tenderloin on this dish, that’s why it’s really tender. Price is very reasonable. After your busy schedule in a day, this is the perfect spot for you to just relax or chill, and hangout with friends or family away from the busy streets plus having some delectable comfort dishes. The place is also open for events or gatherings like reunion, birthdays, parties etc. You can cater to them amounting to Php200 per head or Php450 if you will order their specialties. For me this is an ideal place if you’re having a get together with families or friends. 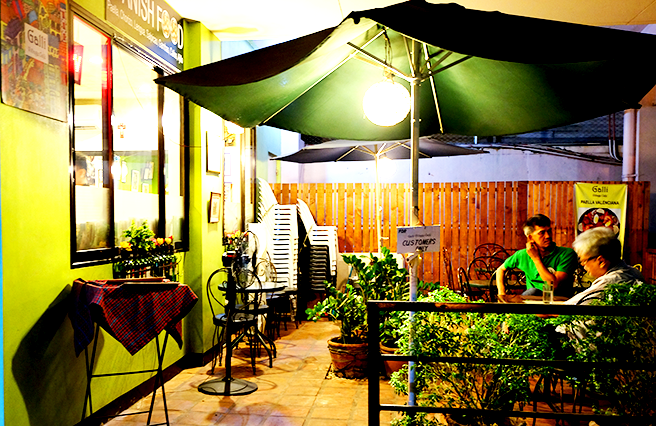 It is budget friendly; they have adequate parking spaces for your visitors, great ambience, and of course great food! 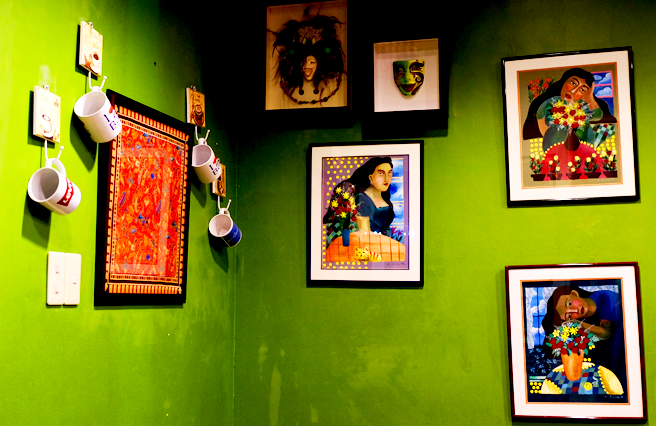 Another branch is located at Maginhawa Street, Quezon City. This second outlet cater to a different kind of market – the younger generation, the chic, barkadas, and those who enjoys the easy going style of life. But Galli Village Café maintains its basic character. 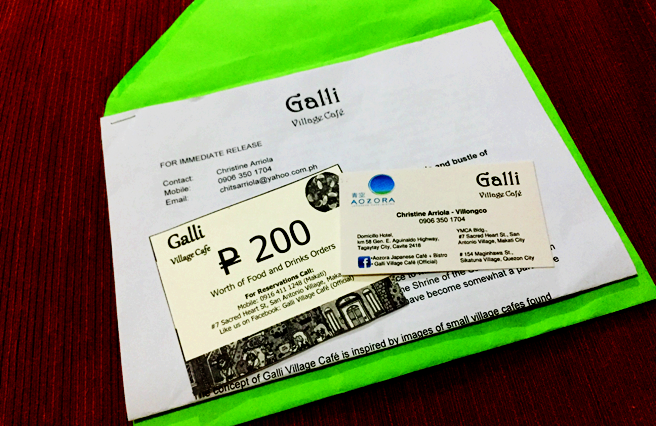 If you want to know more about Galli Village Cafe, or interview the owners, feel free to contact Christine Arriola - Villongco at 0906 350 1704 or email Christine at chitsarriola@yahoo.com.ph.